Cheap flights Wroclaw-Morocco for only €70! Here’s great offer for all travellers who want to enjoy a bit more of warm weather and visit interesting country at the same time. You can now book return tickets from Wroclaw to Morocco for only €70. This trip is intended for experienced travellers because you land and depart from different airports. The whole itinerary looks like this. Dates with low prices are specified but you can find more combinations on different dates if you play around with the booking systems a bit. As you can see you have to combine two airlines to get the best price, the flights are well connected with few hours of waiting at the airport inbetween. The price is valid if you travel with cabin luggage. Ryanair offers free 10 kg luggage up to 55 cm, while Wizzair allows only 42 cm luggage in the basic price (you can always pay €10 extra for the bigger luggage). The price for Wizzair flight is also valid for Wizz Discount Club members, other travellers have to pay €10 extra. If you are not member of Wizz Discount Club, it’s well worth it to fly with Ryanair on all flights because you don’t have to pay extra for bigger cabin luggage. 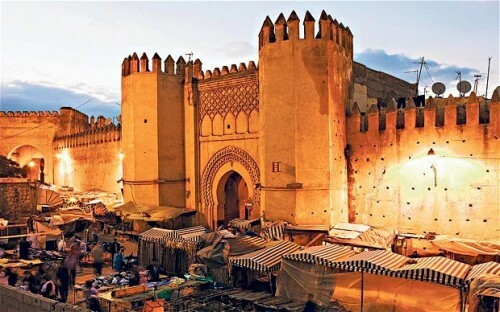 You will have 9 days in Morocco which should be more than enough to travel from Fez to Tangier – both cities are connected with a train. Book at Wizzair and Ryanair. Fez and whole Morocco is really cheap country where you can sleep for €4 per night without problems. Check our accommodation search engine to compare all major booking sites at once! « Cheap flights to Jordan: Aqaba for just €155!